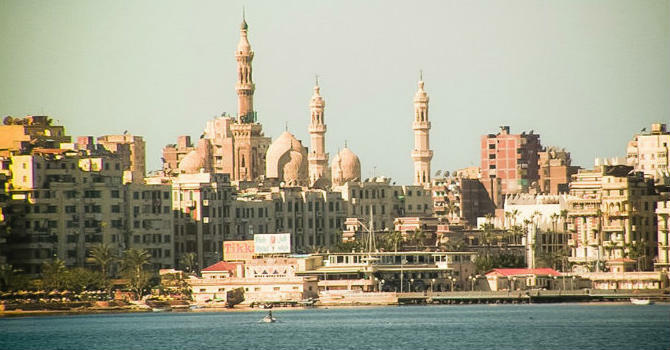 Meet by the cruise exit in Port Said then travel in private modern vehicle with personal proficient guide to visit Cairo. Wander the Pyramids of Cheops, Chephren and Mykerinus then continue to the Great Sphinx with pharaoh head and lion body, also admire the Valley Temple attached to the Pyramid of Chephren. Proceed to the Egyptian Museum of Antiquities which displays artifacts from almost all historic ages of ancient Egypt covering about 5000 years of art including an exceptional exhibit devoted to Tutankhamen, Royal Mummies room and big library. Get your lunch in local restaurant then drive to your hotel in Cairo and overnight. Breakfast in Cairo hotel then travel with air conditioned modern van to Alexandria. Visit the Catacombs of Kom Al Shokafa, it dates back to the Roman period, firstly been a family tomb then turned into public tombs, It was found in 1900 by the pure chance. Proceed to Qayetbay citadel, established at the entrance to Alexandria eastern harbor at he same spot of the ruined Lighthouse. Stroll the busy Alexandria library built at the same place of the ruined Alexandria Bibliotheca. Get your lunch meal then drive back to you cruise.